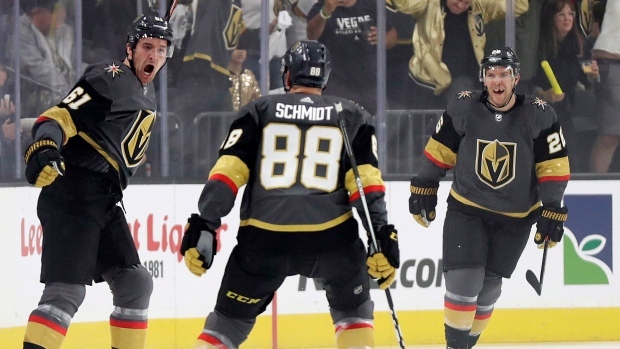 LAS VEGAS — Mark Stone had three goals and two assists, and the Vegas Golden Knights beat the San Jose Sharks 6-3 on Sunday night to take a 2-1 lead in their first-round playoff series. It was the fastest goal in the playoffs since San Jose's Joe Pavelski scored 15 seconds into a first-round game in 2007. Stone has six goals in the playoffs already. Stastny accounted for both of Vegas' goals in the second as the Knights opened a 4-1 lead. San Jose rallied in the third. Couture got his second of the series when his pass intended for Joe Pavelski was tipped in by Vegas defenceman Brayden McNabb. Then Meier knocked in a rebound after Gustav Nyquist's shot was stopped, making it 5-3 with a little more than 14 minutes remaining. NOTES: The Golden Knights signed forward Nikita Gusev to a one-year, entry-level contract and expect the Moscow native to join the team for practice on Monday. Gusev, 26, had a Kontinental Hockey League-high 82 points in 62 regular-season games. During the KHL playoffs, he recorded 19 points, which ranked second in the league. ... The Golden Knights are the 13th team in NHL history, and third in the last 30 years, to score in the opening minute of back-to-back playoff games.